By the 1980s black culture was flourishing with vigorous innovation. Blacks began becoming heavily profiled in politics and the arts as hip hop began to rise in New York midway through the decade. Films like Breakin‘ were made to capitalize on the new scene, just as director Michael Schultz’s 1985 cult hit Krush Groove intended to do. Featuring break out stars Run DMC, Shelia E, The Fat Boys, Curtis Blow, and Blair Underwood in his film debut as a characterized version of Russell Simmons, Krush Groove follows Russell’s attempt to start up and maintain his own hip hop label. With success knocking on their door, Russell and his labelmates realize that with more money comes more problems and pride begins to wedge itself between Russell and his baby brother Run. Krush Groove is dated and cheesy, though at times there are admirable aspects to be praised about it. Director Micheal Schultz, whose films Cooley High and Car Wash are canonical in the history of black cinema. Schultz masters modes of capturing cliques of people allowing Krush Groove to be a film that’s more about the dynamics of a group rather than part one person’s struggles. Ernest Dickerson, who’d later rise to fame with his spectacular crime-drama Juice, acts as director of photography in Krush Groove bringing feather soft lighting that makes the world we are brought into almost dreamlike through the glowing blurs of light radiating off any and all lightly colored objects. gives viewers a taste of. With 808 drum machines and synthesizers featured on nearly everything throughout the film, Krush Groove proves itself to be so 80s that you can almost smell the crack cocaine and see the acid washed jeans surrounding the screen. Yet, in spite of the bad jherri-curled hair, kangol hats, Adidas track suits, Krush Groove’s 80s aesthetic is its most charming aspect. The major downfall of Krush Groove is its weak script by Ralph Farquhar. Krush Groove is nothing short of predictable and flat. The film is mostly an hour long music video of various artists with about half an hour of plot. Situations arise and develop clearly only to advance the story giving viewers a stereotypical romantic relationship to root for that has as little chemistry as it makes sense. 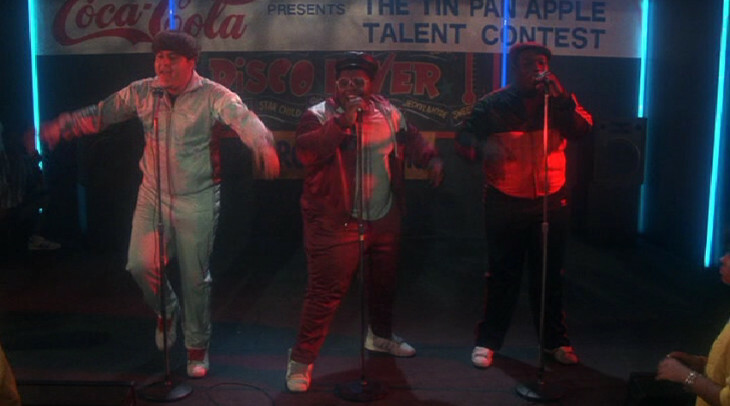 Anyone who watches Krush Groove can predict its ending about 10 minutes into it. It’s a generic struggle of success for every major conflict introduced which makes the film an insipid bore as it winds down by the end. Despite being a product of the past that’s at times nauseating to watch, Krush Groove’s representation of the black community is a positive uplifting look. There’s no racial divide or need for addressing one another’s race. 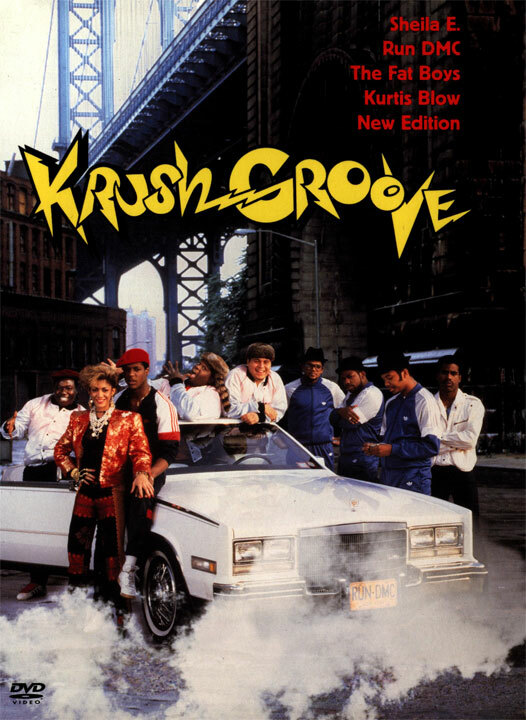 Instead, Krush Groove is almost like an archetype of a post racial film that is simply meant to showcase the birth of a movement and not limit it to racial qualms. Krush Groove exhibits what hip hop should have grown into as during a scene in which The Fat Boys sit and contemplate their motive as rappers. They decide they should rap about what they like and be true to themselves; food. Krush Groove is a sad reminder of how rap music has been bastardized as the generations continued and performers began to use the lifestyle to identity themselves instead of identifying themselves within the lifestyle.